The name Hubble is likely one you recognize. It is a space telescope orbiting earth that has given us a lot of fascinating information of the ongoing activity in space during the past 27 years. Don’t worry, I’m not here this week to tell you about the end of another journey, but rather the continued journey and discoveries of Hubble! In 2006, Spacewatch, one of NASA’s programs, discovered the asteroid 300163 2006 VW13, located in the asteroid belt between Mars and Jupiter. Later, in 2011, a closer look at its properties were taken by another program called Pan-STARRS, who discovered that this asteroid had comet-like features and designated it as 288p. The comet-like features this asteroid contains are the coma and the dust tail (See image one). Despite the fact that 300163 2006VW13/288p was categorized as both an asteroid and comet, it still did not deem itself special enough. 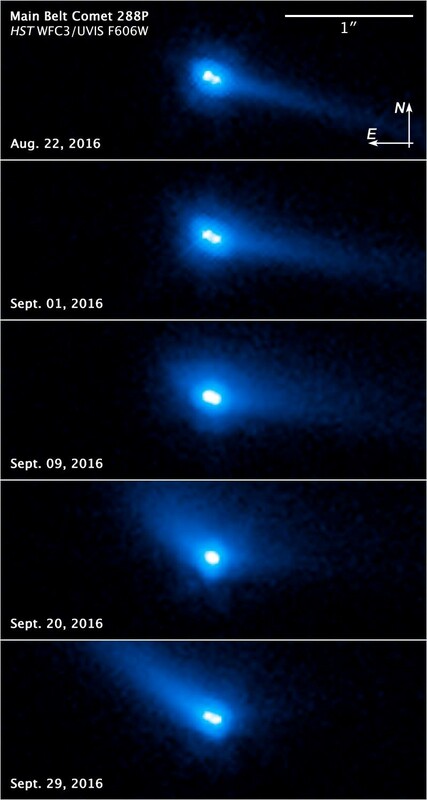 In September of 2016 Hubble captured images of this asteroid/comet and a science team in Germany discovered it was a binary system of two asteroids/comets orbiting one another. So not only is 300163 2006VW13/288p classified as an asteroid with comet features, but is also two asteroids orbiting one another! The leader of the team who discovered this binary system, Jessica Agarwal, stated, “We detected strong indications for the sublimation of water ice due to the increased solar heating — similar to how the tail of a comet is created.” They conjecture that the formation of the two asteroids/comets was caused by a piece breaking off because of the fast rotation of 300163 2006 VW139/288p, but the two pieces stayed within orbit of one another.